Provide comfort for the family of Ann Sadighian with a meaningful gesture of sympathy. Mrs. Ann Q. Sadighian, R.N., age 93 of South Hill, VA, died Friday, February 1 2019. 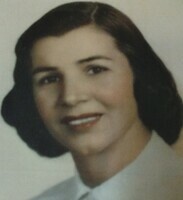 She was preceded in death by her husband of 56 years, Zabih Dean Sadighian, M.D. She is survived by her three sons, Zabih J. Sadighian of Alexandria, VA, Joseph A. Sadighian of Henrico, VA, and Jim John Sadighian, M.D. of South Hill, VA, her granddaughter Caroline E. Dyar of Durham, NC and her grandsons James C. Sadighian and Philip D. Sadighian. Ann worked with her husband in his medical office from 1968 until he retired. After her husband retired, she received a bachelor's degree in nursing at J. Sargeant Reynolds and worked for Lake County Area on Aging. She loved reading literature, working in her garden, travellng with her husband, and spending time with her grandchildren. A funeral mass will be conducted at 9am on Saturday, February 23, 2019 at Good Shepherd Catholic Church in South Hill. In lieu of flowers send donations to the Good Shepherd Catholic Church, 1644 N. Mecklenburg Ave. South Hill, VA 23970. Farrar Funeral Home is serving the Sadighian Family.